Most lamps are just that, offering light at the touch or press of a switch. 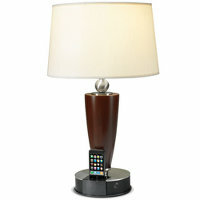 Well, the iPod Lamp from Hammacher works differently, and as you can tell by its name, it will be able to play nice with an iPod thanks to its built-in iPod dock complete with speakers. This will definitely help you save whatever little space you have left in your cramped apartment (that’s the case these days what with a global population explosion). You can dock either an iPod or iPhone, where the two 10-watt speakers won’t bring the house down, but they ought to be good enough to keep a small room filled with music. A quartet of buttons control on/off for the lamp and audio, not to mention its volume as well. If you have another non-Apple portable media player, it works just as well via the auxiliary input. 3G iPod owners are out of luck though with this $199.95 thingamajic.